Every once in awhile, I hear something in passing conversation and think to myself, "I need to make that!" This is precisely what happened here. I'm not a big sandwich guy, but years ago, I could never get enough of the Monte Cristo sandwich from Bennigans. 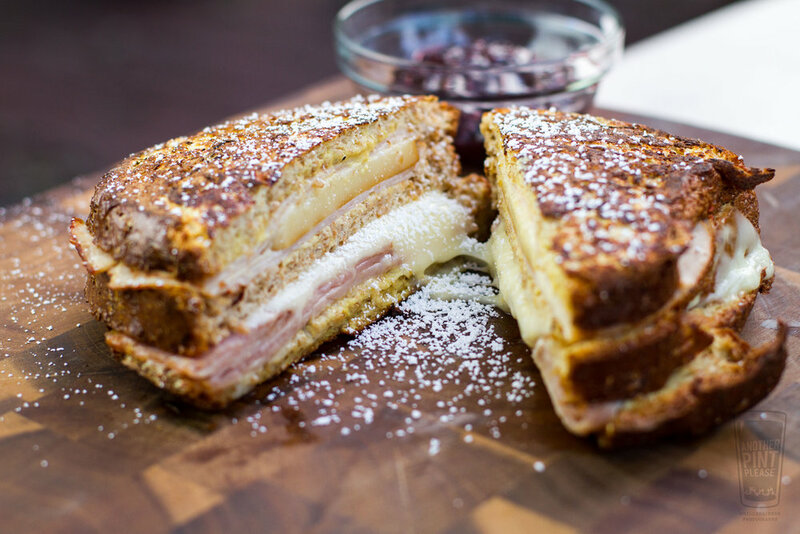 The Monte Cristo is a mixture of ham, turkey, and cheese, bathed in egg wash and fried. Covered in powdered sugar, the sandwich was rounded out with a side of raspberry jam. It was heaven on a plate. At least to me. 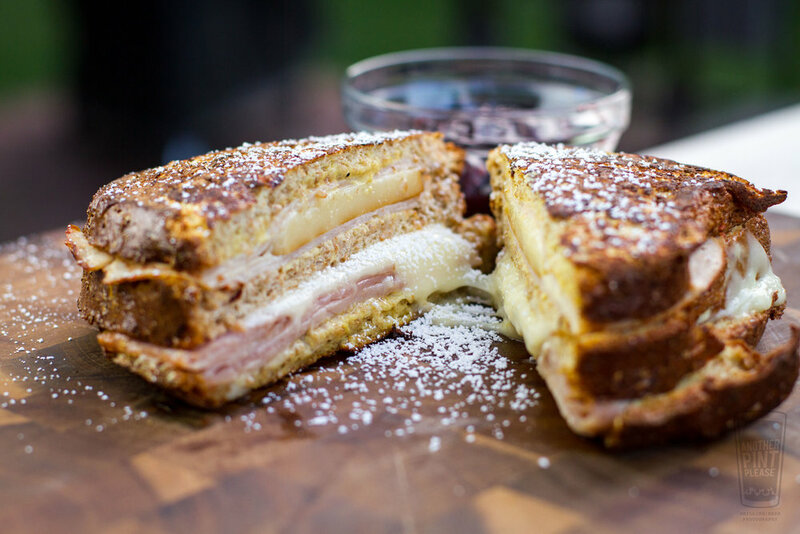 Sometime last week, I heard the words: Monte Cristo. For all I know, it could have been a discussion of the book. All I know is I was destined to make a Monte Cristo on the grill. Much like my hazy memories of this extra special sandwich, my current incarnation didn't disappoint. It was cheesy, savory, and sweet as ever. 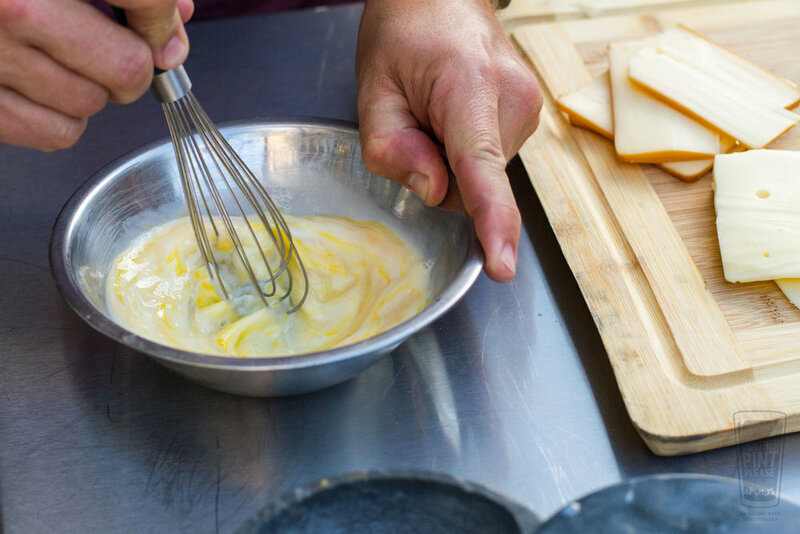 Take a slice of bread and cover with dijon mustard. Stack 2 slices of turkey, ham, gruyere, and swiss. 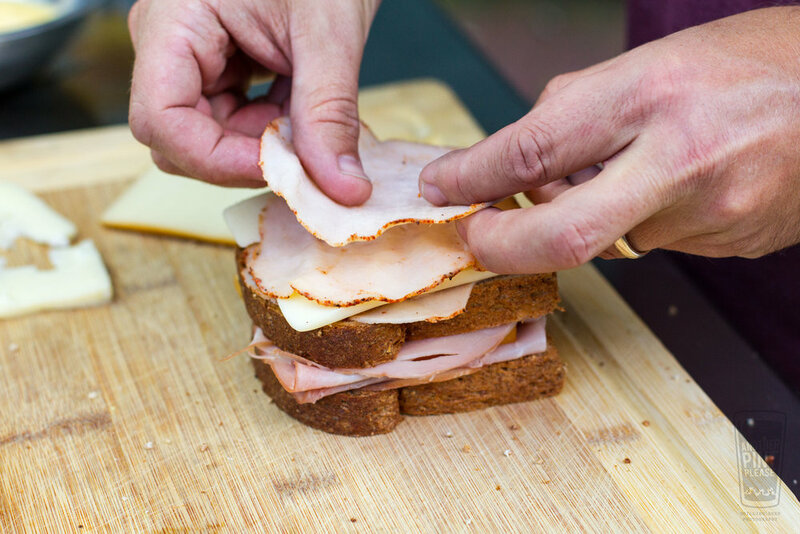 Top with another slice of bread and add 2 more slices of turkey, ham, gruyere, and swiss. 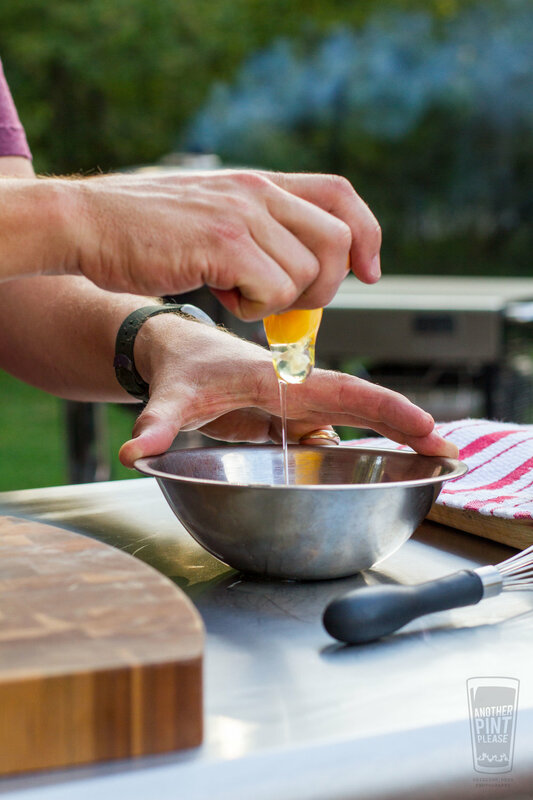 Add more dijon to another slice of bread and stack, mustard side down. Repeat for a total of 3 sandwichs. 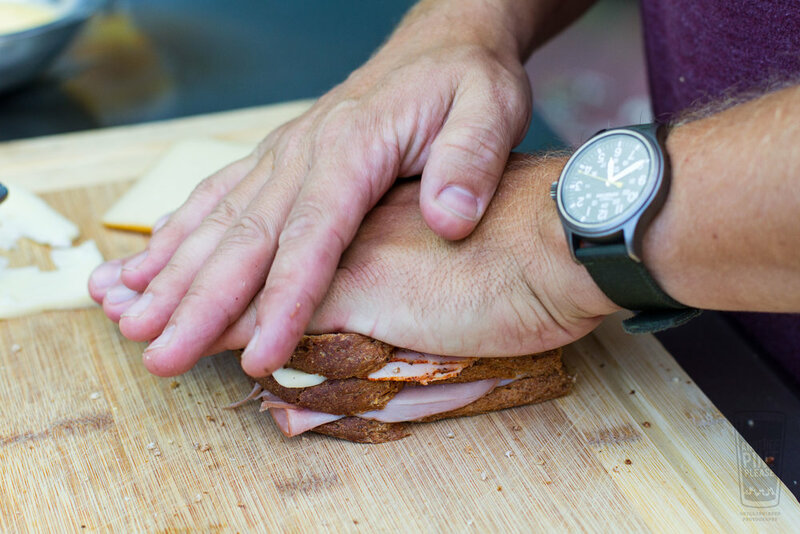 With your hands, smash the sandwiches down. Add in the milk and whisk together. Note: The griddle for Weber's Gourmet BBQ System is an awesome tool. However, depending on what you are "griddling" shapes how it is set up. For these sandwiches, it's important to use an indirect arrangement of coals. I want very little heat under the griddle, as the sandwiches are delicate, and unlike a steak, can't handle a super intensive cook. To avoid grilled hockey pucks, the key here is lower heat, a longer pre-heat, and a longer cook time. 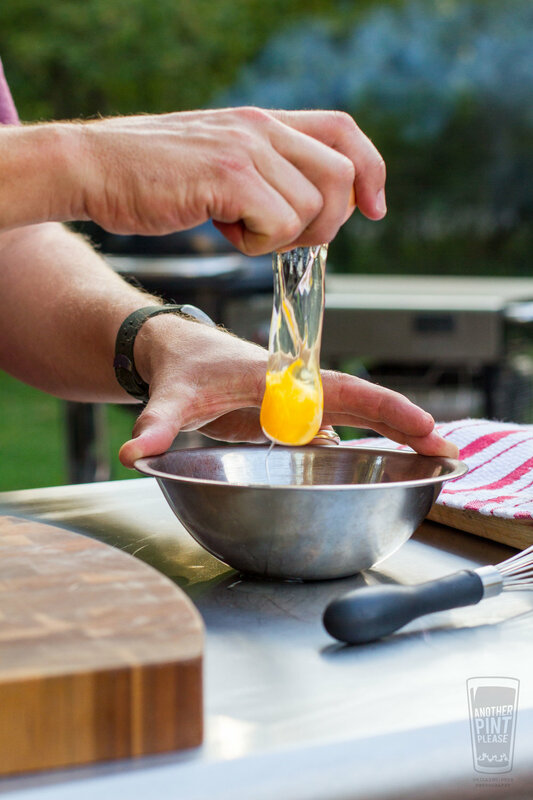 With the coals lit, add the griddle, and preheat for at least 15 minutes at indirect medium heat, 350-375° F.
Dredge all sides of the sandwiches through the egg bath. 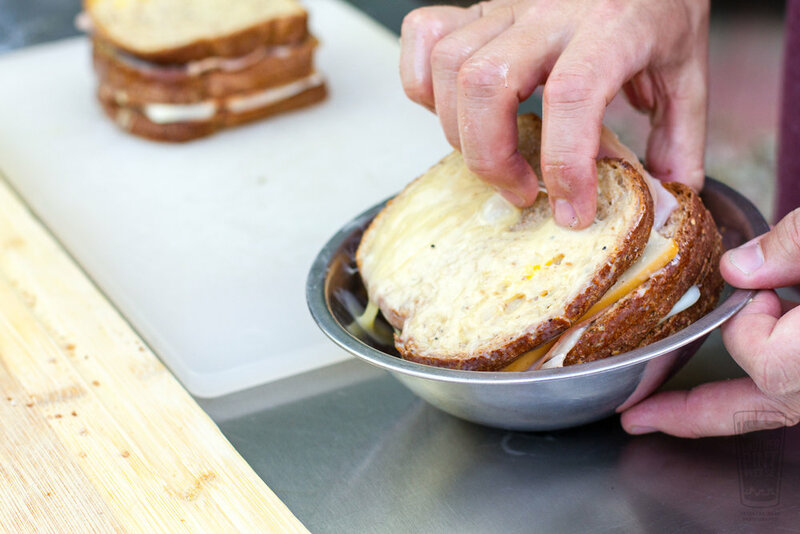 Grill the sandwiches for approximately 25-30 minutes, flipping once. Keep the lid down as much as possible. Once done, remove and slice. Cover with powdered sugar and serve with the jam. Bennigans may be gone from the area, but my love for these sandwiches is still firmly here. I'm glad my memory didn't disappoint.